MANHATTAN — They've logged dozens of miles during months of training, but now it's down to the last few days of preparation for the 45,000 runners competing in the New York City Marathon this Sunday. DNAinfo talked to two professional trainers for insider tips on what to do before, during and after the 26.2-mile race to make sure you have a great marathon experience. Rest. "There's nothing you can do at this point to improve your fitness in time for the race. At this stage, you can only hurt yourself by doing too much," said Brian Rosetti, an Upper West Sider who founded of The Run SMART Project, a coaching service for runners. Take a few days off completely this week, said Rosetti, and limit your running to a two or three mile run at your goal pace or a little faster on Tuesday or Wednesday. Runners react as the cross the finish line of the New York City marathon in 2010. Get a massage. After months of training, your muscles are beat up. Help them recover with a massage from a professional who's worked with runners before, Rosetti said. Schedule the massage for three or four days before race day, so muscles have time to bounce back from the tissue damage that goes along with a thorough rub-down. Don't surprise your body with new foods. "We tell people, stick to what you’re used to eating," Rosetti said. He advises runners not to be tempted to try new nutritional strategies to boost performance. Some runners try starving their body of carbs for a few days, then loading up on pasta and bread. Others turn to unusual foods such as beet juice in the hopes of boosting performance. Trainer Nicole Cea McDermott, a former professional dancer who now runs a personal training business and boot camp in Riverside Park, knows this from personal experience. She tried a sports bar she'd never eaten right before her first half-marathon, and ended up with an upset stomach during the race, followed by post-race vomiting. "Don't change anything in your diet," McDermott agreed. Visualize race day. Meditating and mentally picturing race day in your head — from the minute you wake up to the celebration brunch afterward — helps runners stay calm and focused in the lead-up to the starting line, McDermott said. Sign up to be in a pace team. When you go get your number the day before the marathon, McDermott recommends signing up for a pace team, especially if you're running solo. You'll be teamed with other runners who run at your speed, which will make hitting your target time much easier, she said. Don't go nuts by carbo-loading. Some runners think they need to shovel in heaps of spaghetti and bread the night before the race, but Rosetti said that's a mistake. He recommends eating a normal breakfast, lunch, dinner, and snacks, with one extra serving of carbs each time you eat. And those carbs don't have to be bread or pasta, he said. Rice, tortillas, sweet potatoes or oatmeal will provide the same energy. Also eat a moderate amount of lean protein such as chicken or fish, as well as unsaturated fats such as olive oil or avocado. Eat an early dinner at around 4 or 6 p.m. and a snack right before bed, and drink a little extra water all day to aid with digestion, Rosetti said. Avoid refined sugar, which can inflame muscles, Rosetti said. "That stuff is not the type of energy you want to be providing yourself the day before the race," he said. Drink two big cups of water before breakfast. Rosetti recommends eating breakfast three or four hours before the gun goes off, and make sure you drink two cups of water before that meal. "Most people don't realize how dehydrated they are when they wake up in the morning," Rosetti said. "It’s really important to facilitate digestion." Go to the bathroom before you line up in the corrals. Runners are penned inside corrals when they line up at the starting line. Once inside, there's no escape — so take care of nature's call beforehand, McDermott said. There are bathrooms along the route, but you don't want to start the race full of anything but enthusiasm. Go over your race plan while you're waiting for the start. Runners will have several hours to kill from when they get up on marathon day until the starting gun. One way to stay mentally focused while you're waiting is to go over your race plan — your personal strategy for meeting your goal time — in your head, Rosetti said. "Everyone should have a race plan about when and how much they’re going to drink at each station, when they're going to take gels and goos to refuel during the race, how fast to go to out," Rosetti said. If you're nervous, distract yourself by talking with your fellow runners, Rosetti said. Wear layers you're willing to lose forever. The forecast is calling for temperatures in the 40s and 50s, which means runners will need to wear layers to keep their muscles warm during the hours they're waiting for the starting gun. If you're not warm enough, your body will waste precious calories and energy trying to keep you toasty, Rosetti said. The New York Road Runners collect discarded T-shirts, hats, sweatshirts and everything else runners peel off, then wash them and donate them to charities. "Wear layers you're OK with giving away," McDermott said. Get pumped up, don't don't get over-excited. When runners are waiting for the start on the Verrazano Narrows Bridge, the sight of the city in the distance and the cheering crowds that await gets their hearts pumping, but don't get carried away, Rosetti said. 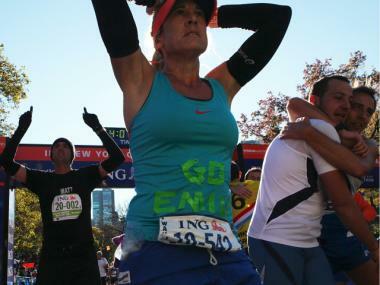 About 45,000 runners are expected to compete in the New York City marathon on Sunday. "You want to be careful not to blow too much energy or adrenaline at the line," Rosetti said. "Everything about the marathon is about conserving your energy." Don't over-hydrate. Some runners mistakenly believe you can never drink too much water, but that's a misconception, said Rosetti. Elite runners looking for a fast time should take a half a cup of water at each aid station, Rosetti said. 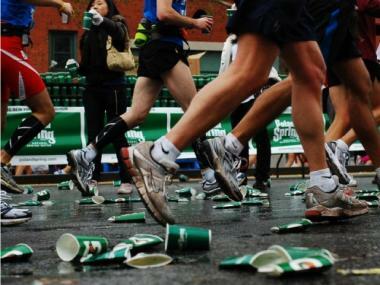 In a study published in the British Journal of Sports Medicine in September, researchers found that almost one in 10 runners drinks as much water as possible when running. This can lead to Exercise-Associated Hyponatraemia — a condition associated with over-hydration that depletes sodium levels in the body. Common symptoms include gastrointestinal problems, cramping and nausea. But EAH can also lead to seizures, respiratory arrest and even death if left untreated. Runners should stay hydrated, but they should be careful about overhydration too, experts said. The best pit stop is at the bottom of the Queensboro Bridge. There are Porta-Potties along the route, but try to wait until after you clear Brooklyn to use one, otherwise you can add 15 or 20 minutes to your race time, said McDermott. Lines are long at the bathrooms early on the route. The best spot she saw during last year's marathon was at the bottom of the Queensboro Bridge around mile 15 or 16, where there are plenty of bathrooms and no lines. "That was a good tip that I wish I would have known last year," McDermott said. Tell your friends and family to watch the race in the Bronx. Most of the 2.5 million spectators along the route are in Manhattan and Brooklyn, McDermott said. When runners reach mile 20 in the Bronx, they're about to hit a wall mentally and physically, so they need all the encouragement they can get there. If you have friends or family watching the race, send them up to the Bronx to cheer on the runners as they head into the home stretch. Avoid excess sugar starting 30 minutes after you finish. Have a sports drink or gel to boost your electrolyte levels post-race, but avoid excess sugar after that, Rosetti said. "You want to focus on decreasing inflammation," Rosetti said. "Sugar, simple carbs, anything made with white flour, is all going to cause inflammation. It's going to make a huge difference in how you’re going to feel." Don't celebrate with booze. Like sugar, alcohol inflames tissues, so it's best to avoid it, Rosetti said. Take an ice bath. After you've had something to eat and drink, head home and sit down in a tub stocked with ice cubes. This step also decreases muscle inflammation. Don't go runnning for a week after the race. If you're going to exercise, do low-impact cardio activities like swimming or biking. "Hide the shoes, sleep in, enjoy the extra rest," Rosetti said. Visit The Run SMART Project for more tips on what to eat the day before, race day, during the race and the day after. 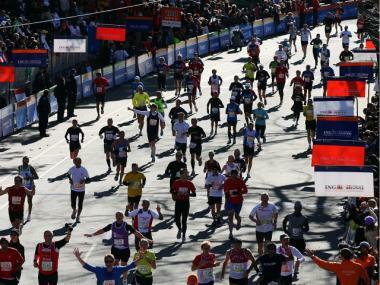 And for even more marathon tips, visit the New York City Marathon's official website.